Welcome to Paris, the city of light. This exuberant city is also known as the city of love, for its romantic atmosphere. Stroll through the boulevards, passing by the bridges to the Eiffel Tower as it lights up at night. 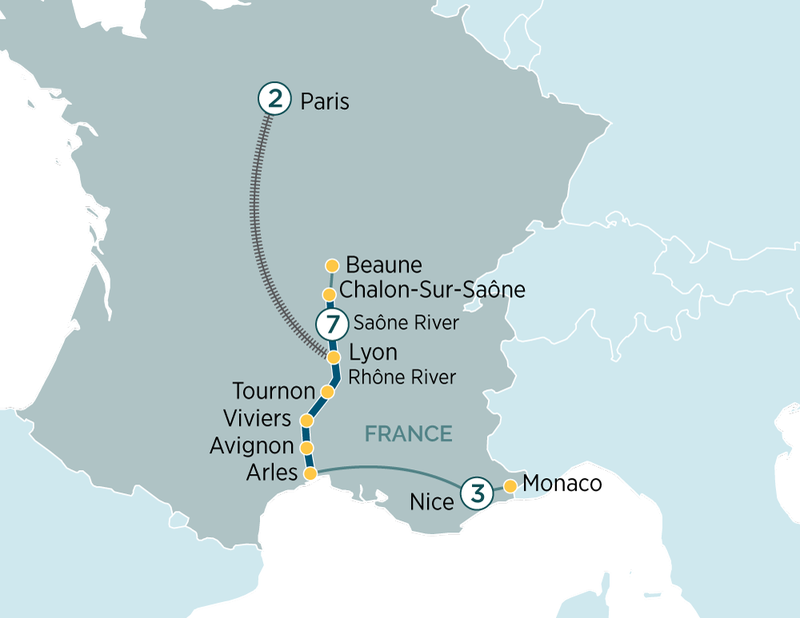 Included is a two-night stay in Paris. Tonight enjoy dinner at your hotel. This morning travel by high speed train to Lyon and transfer to the ship where you will be welcomed by your Captain and crew. Tonight, enjoy a welcome reception and dinner on board. Nice, the capital of the Côte d’Azur, is beautifully curved round the Bay of Angels, desirable and as lively as you like. In the morning we will take you to Monte Carlo for a guided tour, where you will learn about the jet set life in Monaco. Enjoy free time to explore in the afternoon.